Although we’re almost constantly on the move, we inhabit a community within which we find support, encouragement and loads of fun. 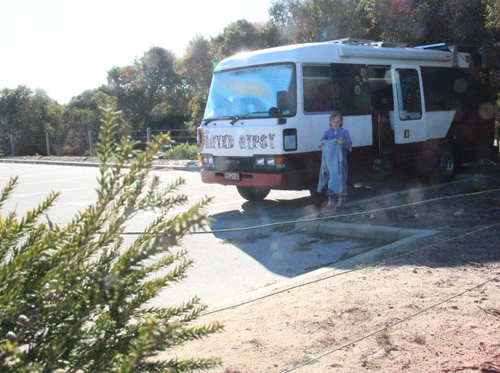 Sometimes our community consists of other homeschooling families and other times it’s travellers we meet on the wayside. I especially treasure the times I spend with our Rainbow tribe — an eclectic group of artistic, musical, international and conscious people who are found all over the globe. 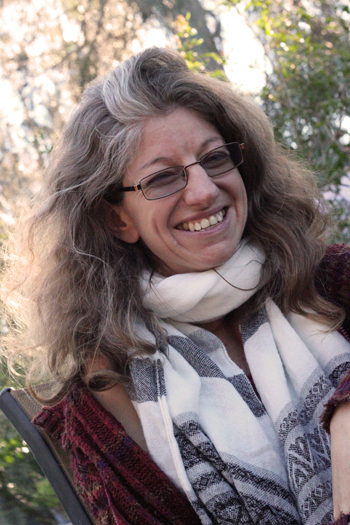 Yesterday I received a call from a beautiful Rainbow friend who put me back in touch with Julia, with whom we had been camping before we flew to Indonesia. Julia invited us around to her house today where they were gathering to farewell one sister as well as to celebrate Julia’s birthday! Last night we park in a secluded beach-side parking spot. It's quiet here, and a nice change from our last two nights in the city. Our day started off really slowly. 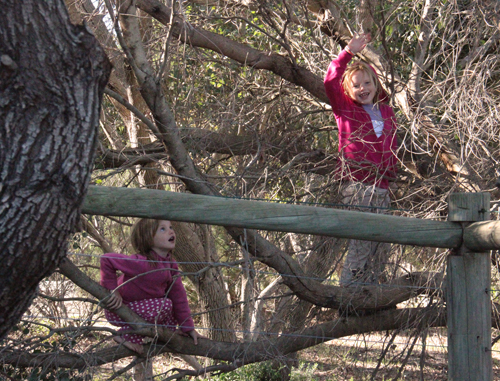 The girls loved our beach-bush location and spent hours exploring the landscape — climbing the trees, combing the beach and finding secret hiding spots. Cali and Brioni have recently formed a special friendship where they "team" together on explorations. Leisurely, I packed up the bus and when the girls were ready we made the short drive to Julia’s house. It’s a basic two-bedroom house in an ordinary suburban street, conveniently bordered by a vacant lot which serves as the parking lot for all Julia’s friends’ cars! Julia is like a ball of sun, radiating warmth and light to everyone she meets. She also exerts a subtle gravitational pull that draws us all in, with at least 30 people coming by her house today for the gathering. 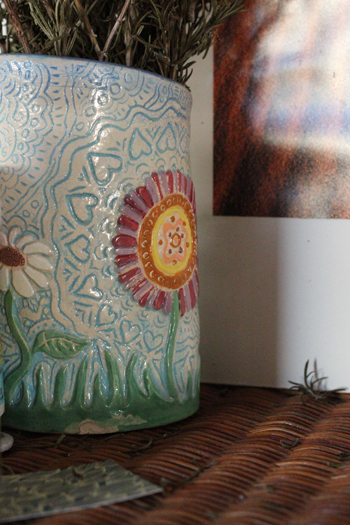 Julia is a talented potter and artist, and her home is filled with her colourful creations. Gatherings of Rainbow people are woven together with food, art and music. 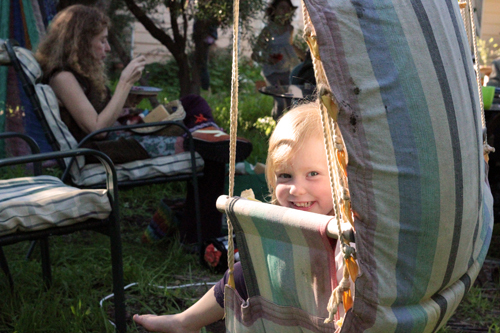 We sat on cushions on the floor or lounged in the garden while the kids played around us. 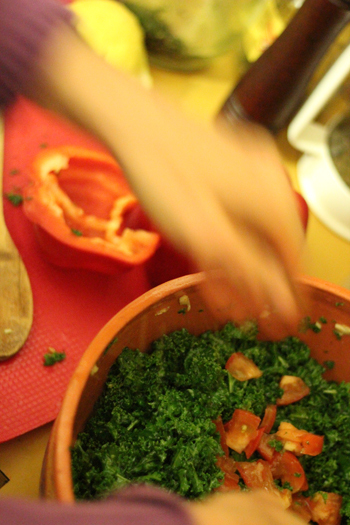 We all contributed food — good healthy food, vegetarian or vegan — and so we ate and ate. Melody sat and needle-felted little gnomes. Tim pulled out his knitting needles and worked on a glove. Sam and Melody played the guitar. I tapped on my bell drum. We enjoy the unseasonably warm day by sitting together in the garden. 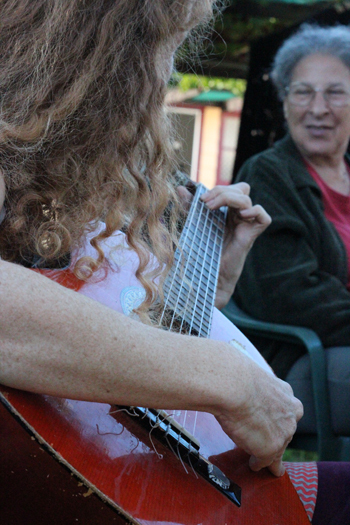 Melody plays and sings a Cat Stevens' song upon request. As a raw vegan, Janey specialises in healthy, yummy food, and she prepares a great big bowl of kale salad for us all to share. 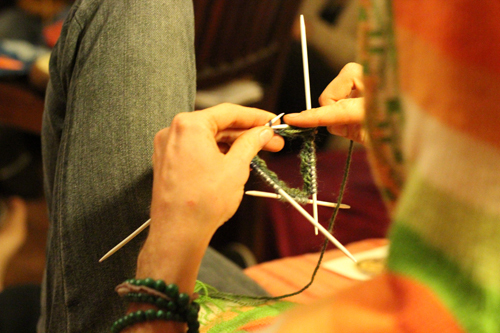 I've never seen someone knitting with five needles before, but Tim makes it look easy. After demonstrating how to use the nut-cracker, Donny watches as Brioni opens the macadamia nuts for Lana. I love the opportunity to reconnect with special friends and also to be introduced to new ones. The diversity of the Rainbow tribe is what makes us so special, for we appreciate and celebrate the identifiable differences among our people! Thank you, Julia, for including us today, and we look forward to seeing more of you in the future! I’m glad to see that you are back to blogging! Delaney goes by Lana now? Must of missed that somewhere along the way.